Are you a dance fitness instructor with a dynamic personality, entertaining skills, and fierce originality that can Wow The Crowd? Want to win a huge cash prize and the chance to show out on stage at TheFitExpo? Now's your chance to join our search for the best instructors on the scene! Brought to you by GROOV3 -- WOW THE CROWD is the official Dance Fitness Instructor Challenge of TheFitExpo. From Latin to Urban Hip Hop, Dancehall to Jazzercise, the search is on to find the most dynamic, entertaining and fierce fitness instructor. 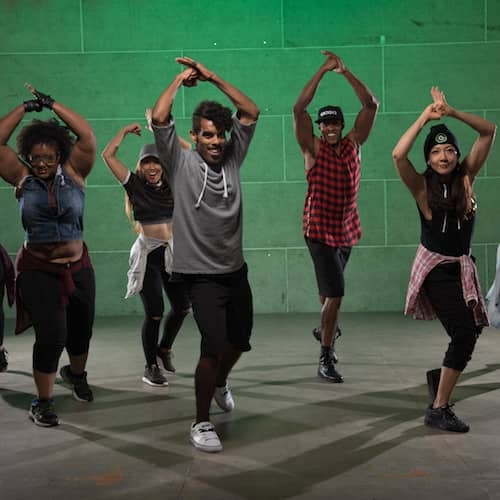 GROOV3 is on a mission to expose the most talented dance fitness instructors on the scene by giving them an opportunity to shine in front of a live audience. Each instructor will have 5 minutes to WOW THE CROWD with their charisma, personality, and talent by leading the crowd in their favorite style. In the end, the crowd will vote on who they believe is the “Best in the Business” and 1 winner will be crowned. Winner will take home $150 and a FREE AFAA Cert. Runner up will receive $50. All finalist will recieve a FitExpo swag bag, a fitness education to FitnessFest and a discount code for a AFAA or Zumba training. Submission are open from April 1st - May 15th. We will accept up to 7 contestants onto the stage. = WOW the Crowd is a closed competition. No one is able to enter the stage area after 10 minutes. At which time entrance will be closed to new attendees. Anyone is welcome to watch from outside the stage area corral. Upon entrance to the competition, persons within the corral will line up to receive their voting coin near the entrance and will “vote” with their coin near the exit. To avoid duplicate votes, each person’s hand will be stamped when they have been given a coin. Must be 14 years of age or older to vote. = There will be NO in’s and out’s of the Group Training Zone Area. Exiting the area will result in loss of voting privileges. = In addition to (1) vote per attendee in the stage area, there will also be a “golden coin” given to one guest judge who will be announced at the beginning of the competition and who does not have a connection to any of the talent. That vote is worth 5 coins. = Voting coins will be counted by Wow the Crowd staff in a secure location and supervised by FitExpo management. = In the event of a tie, if time permits there will be a dance off. Each contestant will have 2 minutes to showcase their stuff 1 more time. Each of the two contestants will turn their back on the crowd and the attendees will line up behind the person they choose to cast their vote. The guest judge will count the persons standing in each line and will announce who the winner is. If time does not permit, a name will be drawn out of a hat to produce the winner in front of the crowd.